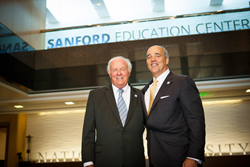 Denny Sanford (left) and Dr. Michael R. Cunningham, Chancellor of the San Diego-based National University System., at the 2014 launch of the Sanford Education Center. The Sanford Harmony program, which is reaching more than 1 million PreK-6 students through a university network led by the private, nonprofit National University System, has been recognized as a leader in social emotional learning by the nation’s pre-eminent organization that evaluates such programs, the Collaborative to Advance Social and Emotional Learning (CASEL). Only a select number of evidence-based programs achieve recognition after undertaking the organization’s rigorous evaluation process, and the achievement affirms the Sanford Harmony program’s dedication to student success. Sanford Harmony , now included as a SELect program in CASEL’s listing of Effective Social and Emotional Learning Programs, offers a comprehensive toolkit of lessons and activities that encourage the development of skills in communication, collaboration, and mutual respect among all children. The program, which addresses CASEL’s five core social emotional learning competencies, aligns with research findings that these approaches support student academic achievement and positive outcomes; It is being offered at no cost to nonprofit organizations and schools – including some of the largest districts in the country - thanks to the generous support of philanthropist T. Denny Sanford, the visionary of the program. In recognition of the program's successful expansion efforts, Mr. Sanford is scheduled to visit a New York City school Feb. 27 that is implementing the program. The initiative is being advanced through a network of universities coordinated through the National University System, including National University that houses one of the Top Ten largest schools of education in the country. University’s Sanford College of Education prepares more teachers for credentials than any other university in the state of California and it is nationwide the third largest conveyer of master’s degrees in education. Universities that have joined the National University System as part of the expansion effort to regions around the country include City University of Seattle, which is also part of the National University System, Long Island University, Touro College, Bellevue University, Texas A & M International, City University of Seattle, South Dakota State University, Nova Southeastern University, East Carolina University, University of South Dakota, and Northwestern College.